The third entry in the Hammer Dracula cycle saw Christopher Lee finally return to the role that made him an international superstar after almost 10 years. Though he only intended to reprise the role for this one movie, he ended up doing so in another 5 films for Hammer studios. Ten years on from Dracula’s death at the hands of Van Helsing the village of Klausenberg is still living in fear of the Vampire king. So much so that whenever anyone dies their bodies are staked, and burned to ash to stop them from coming back as Vampires. Father Sandor a local monk and expert on the paranormal puts a stop to this. He knows that Dracula is dead and that there is no danger any more. Though many people thank him for stopping their loved ones corpses from being desecrated, others who are still scared of Dracula’s influence despise Sandor, who in turn makes no effort to hid his disdain for them either. Two brothers Charles and Alan Kent and their wives Diana and Helen stop off in Klausenberg on their way to Karlsbad. There they meet Father Sandor who warns them not to go to Klausenberg as there is danger along the way there. Though he does not share the villagers beliefs that Dracula is still alive, he does warn the Kents that there is very real danger near the castle that lies between Klausenberg and Karlsbad, and that they are to stay away from the castle above all else. Unfortunately when passing by it their scared coach driver abandons the Kents. With no other choice the foursome decide to spend the night in the castle though Helen feels uneasy. When they arrive at the Castle they meet Klove who tells them that his master Count Dracula died ten years ago and that it was always his wish that any guests be entertained. After a meal the Kents spend the night there. Alan soon however becomes distracted by a noise in the night and goes to investigate. Whilst he is searching the castle he is attacked by Klove from behind who kills him. Klove then hangs his corpse upside down over Dracula’s remains that he has gathered together in a coffin. He slices Alan’s guts open and spills his blood on Dracula’s ashes which brings the Vampire back to life. Following this Klove then lures Helen down to the castle’s crypt where she finds the sliced up remains of her husband stuffed in a box. Before she can flee she is ambushed by Dracula who claims her as his first victim. The next morning Charles and Diana wake up to find no trace of Alan and Helen. Charles spends the entire day looking for them. After the sun goes down Dracula emerges from his coffin looking for fresh blood. Helen also now rises as a Vampire and very nearly kills Diana. Dracula however chases Helen off wanting Diana for himself, Charles attempts to intervene but his no match for the Vampire who ruthlessly beats him. Just as Dracula is about to kill Charles; Helen burns herself on Diana’s cross whilst trying to bite her. Realising that this is their weakness Charles quickly grabs two pieces of a broken sword (which Dracula snapped in half when Charles tried to stab him with it) to make a cross that he uses to ward the two Vampires off. He and Diana then escape into the forest with Dracula in hot pursuit. The two are later found by Father Sandor who takes them to his monastry. There he tells Charles who Dracula really is and warns him that once a Vampire sets its sights on a victim it will never rest until it has claimed them. With Klove’s help Dracula and Helen are able to sneak their way into the monastry. Helen manages to bite Diana, but fortunately Sandor cauterizes the wound before it infects her. The monks later manage to catch Helen and stake her, however whilst they are slaying her, Dracula captures Diana and flees the Monastry back to the castle. Having no time to feast on her blood as the sun is rising, Sandor and Charles follow Klove back to the castle during the daylight, where he keeps his master and Diana sealed in coffins. Sandor and Charles manage to catch up to Klove just as they arrive outside the castle. There Klove tries to kill them, but Charles shoots him with Sandors gun. The horses spooked by the gun shot charge on and crash the carriage and Dracula’s coffin subsequently falls out onto a frozen moat by the castle. Charles goes to stake Dracula, but with there only being a few moments of light left he doesn’t get there in time and Dracula bursts from his coffin and overpowers Charles effortlessly. As he savagely beats Charles, Diana tells Sandor to shoot Dracula, but he tells her that it would do no good as a gun can’t harm a Vampire. Still she shoots and breaks the ice. As the water flows Sandor remembers Vampire lore that they cannot cross running water and will die if they are completely submerged in it. He then proceeds to fire at the ice around Dracula’s feet which breaks it and causes Dracula to sink into the water below whilst Charles escapes. Dracula lets out one final scream as he sinks below the water to his death. Dracula Prince of Darkness is definitely one of the strongest sequels to the original. Its story is fairly basic. A group of travellers get holed up in an old castle and there’s a creepy host and a monster and the travellers get picked off one by one. Still it has so many interesting elements and ideas that I feel it rises above its somewhat cliched premise superbly. To start with Father Sandor is a brilliant character. He’s not quite on the level of Van Helsing, but I feel that he makes a great enemy for Dracula. Sandor also again unlike some of the later blander leading characters has a massive big personality. He is in many respects the polar opposite to Van Helsing. Van Helsing was often very quiet, very gentlemanly, and always kept his cool no matter what the situation. Sandor in contrast is big, loud, boisterous, rude, and makes no attempt to blend in or conceal his true motives and feelings. He tells people they are superstitious, frightened idiots, and goes out of his way to make them feel uncomfortable, such as telling people that he enjoys warming his buttocks by a fire! Sandor is also a man of god whilst Van Helsing was a scientist. Even physically Sandor was the opposite to Van Helsing. Cushing was obviously very thin, and wirey and very smartly dressed and neat and clean shaven, whilst Sandor had a much larger build and a thick beard. Underneath his gruff exterior however Sandor is still every bit as compassionate, caring and dedicated to destroying the supernatural as Van Helsing himself is. I would have loved to have seen a film that had brought both Cushing’s Van Helsing and Father Sandor together. In fact after Dracula Prince of Darkness I wish Hammer had done another Van Helsing sequel that saw him and Father Sandor work together to take on a bigger supernatural threat than Dracula. They would have worked quite well together as Van Helsing is so straight laced whilst Father Sandor is obviously quite a maverick. I can imagine them clashing over quite a few things. Andrew Kier who plays Sandor does a terrific job with the character and its a shame that his performance is so overlooked by fans as really in many ways I think he carries the film at certain points. Aside from Kier another stand out performance in this film is Barbara Shelly who plays Helen. Helen starts out as a scared, but rationale and intelligent young woman. She is the only one who doesn’t want to stay at Castle Dracula and constantly worries that something terrible will happen to them. This just makes it all the more tragic when after having her pleas ignored and even mocked by Charles she and her husband both suffer gruesome deaths. After she becomes a Vampire she is every bit as savage and vicious as Dracula, deliberately seeking out and trying to butcher her two closest friends. Shelley is brilliant at capturing the two such different sides to Helen. In many ways she actually has the most difficult role in the film but she excels completely at showing Helen go from an innocent, scared young woman to a bloodthirsty, vicious monster. Christopher Lee meanwhile the films star actually has very little screen time. Added to that he has no lines of dialogue and only hisses and screams throughout the entire film. Still I think this works within the films story as Dracula is depicted as being literally like an animal stalking his victims relentlessly for no reason other than to tear his victims limb from limb. Having him just snarl and roar I think really help conveys the count’s single mindedness. I think this was actually a very difficult performance for Lee to get right. He could have looked silly just hissing at people, but fortunately he manages instead to make the Count seem like the bloodthirsty Demon he is supposed to. The way Dracula is brought back is interesting. The idea that he can be brought back by blood being spilled on his remains makes sense in a way as Vampires feed on blood, but it also I feel raises a very interesting question of was Dracula’s death in the first movie the first time Dracula had been destroyed? For all we know he could have died many times before that, but he always manages to come back. Dracula’s influence is so great that there will always be servants of his around the world who can bring him back. He is an evil that truly will never die. Overall Dracula Prince of Darkness is a classic film and definitely one of the strongest entries in the series. 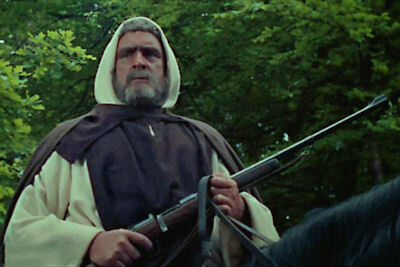 The character of Father Sandor later renamed Shandor went on to appear in a spin off comic book series in the 70s. Titled Father Shandor Demon Stalker, the series was set after Dracula Prince of Darkness. It saw one of Shandors friends perform an exorcism which caused him to be sucked into a Demon dimension. Shandor in order to rescue him later performed a ritual to open a portal to the dimension. He ventured into it and managed to save his friend, but unfortunately whilst there he became cursed by a Demon and after he returned he found that he would kill anyone he touched. Shandor then proceeded to travel the world using his new found Demonic powers to battle, Demons, Vampires, Zombies, Werewolves, Ghosts and various other creatures. His archenemy was the succubus Jaramsheela. Dracula never appeared in the series, though he was mentioned many times. It was Christopher Lee’s decision to play Dracula silently. He was given lines in the script but he found them so poor he refused to say them. The final Dracula film to be directed by Terrance Fisher. Much of the cast and crew from this film would be reunited for Rasputin the Mad Monk which was released back to back with Dracula Prince of Darkness. 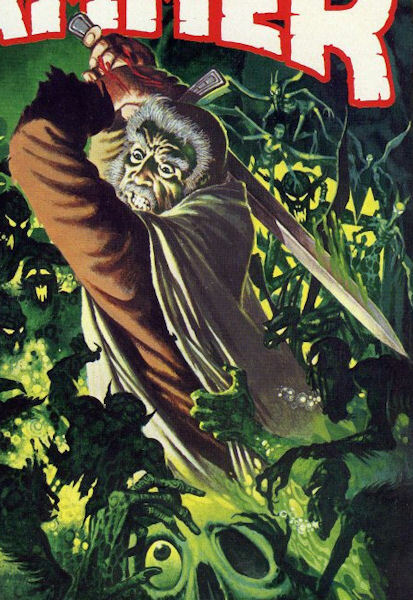 It is revealed in the next entry of the series that whilst he was pursuing Diana and Charles through the woods, Dracula returned to Klausenberg. There he brutally murdered a young woman and strung her corpse up in the bell of church tower to let the locals know he was back. The idea of a Vampire being brought back from the dead by spilling blood on their remains has appeared in other works. In Being Human Herrick is brought back to life when his Vampire followers bring him back by spilling their blood on his remains, whilst in Buffy the Vampire Slayer season two the Master’s minions attempt to bring him back by spilling the blood of those who were nearest to him on his bones.